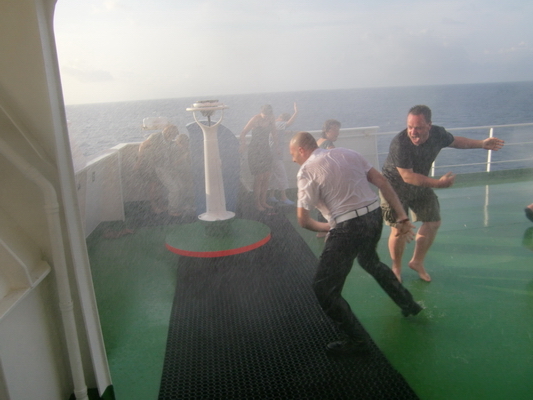 A real water battle started, everybody became wet to the skin. 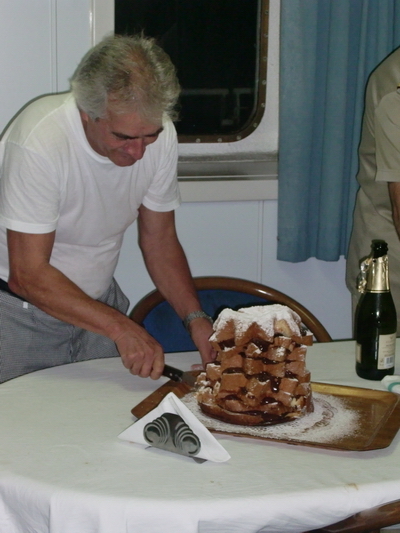 Reluctant persons, like Massimo our steward, were thrown into the fight. 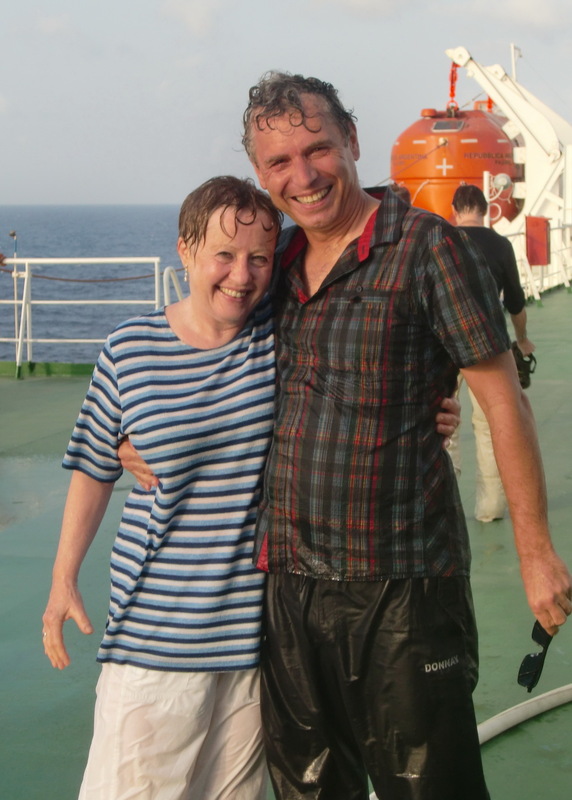 But Massimo had received his first equator baptism few hours earlier, already. He was standing on the railing of the 8th deck, viewing the ocean. 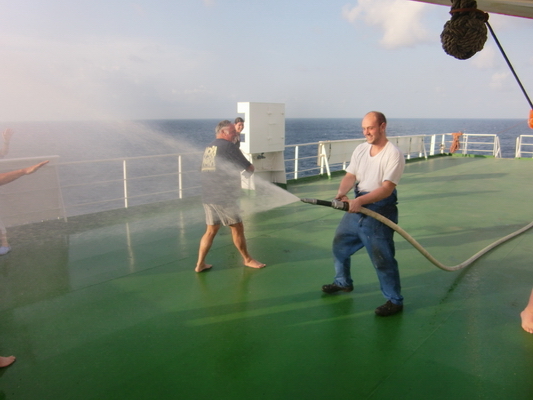 Suddenly somebody from the top deck, above him, poured over him a full bucket of water. 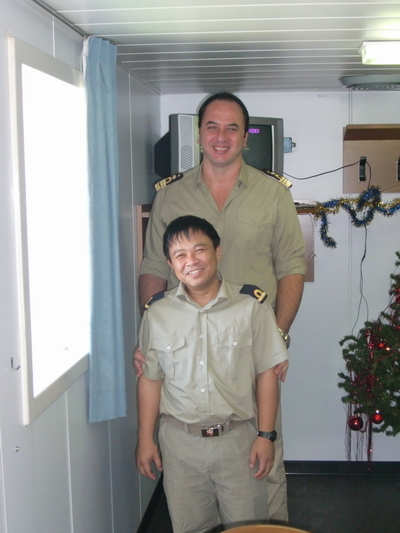 So he was twice baptized on his first crossing of the equator. We had a lot of fun. In the evening the washing and drying machines were very busy! Christmas Eve was nothing special. After dinner we played cards, drunk our last red wine and ate a lot of gingerbread. This was a bad mistake! 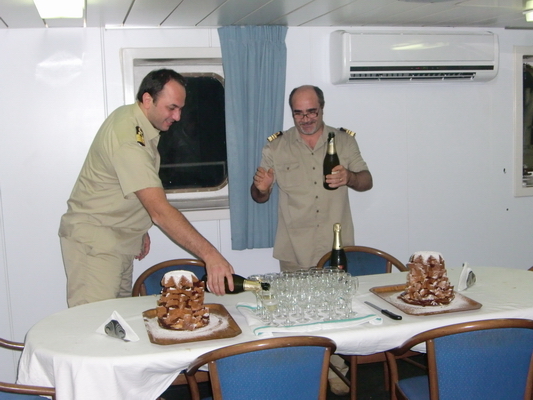 At midnight everybody was rounded up, the captain made a brief speech and served some sweet champagne. And then we had to eat Panatone, the Italian Christmas specialty. It is very heavy: A cake with a lot of chocolate inside. It was late, when we went to bed with a more than full stomach. Fortunately we skipped breakfast in the next morning and the lunch was postponed to 12:00AM. So we were able to do some bicycling in the morning and to gain at least something like hunger. 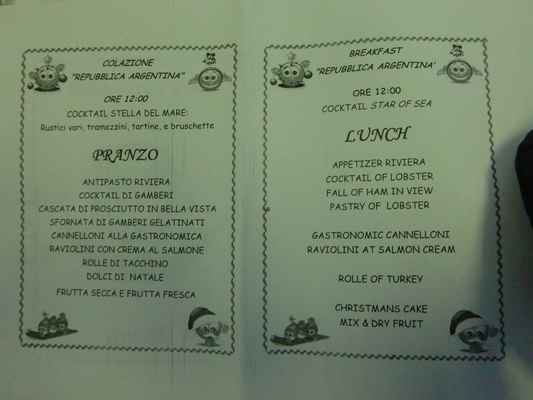 All passengers and the whole crew, besides two persons on the bridge, were eating together Christmas lunch. Simply spoken it was overwhelming, our cook had done an outstanding good job. It started with "small" appetizers like mini pizzas in the lounge. And of course our captain did a short speech again. Then he asked one of the Officers for a photo, which created some friendly laughter because there was a significant difference between them. We were more or less full, when we moved to the dining room. And we were really shocked, when we read the menu list. So much more to eat! And we ate more than two hours more, and definitely much too much. 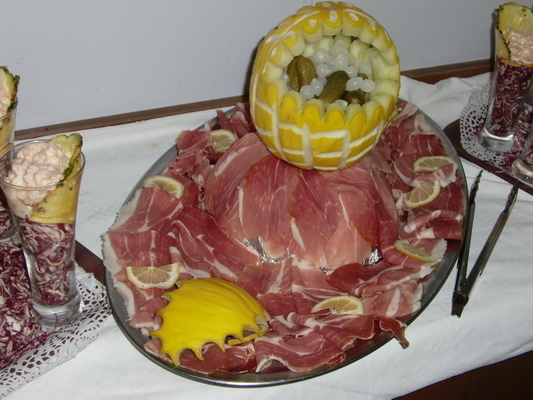 But the food was presented is such a nice way that it was impossible to withstand! We were so exhausted that we slept more or less the whole afternoon. And dinner was late, very short and quiet.